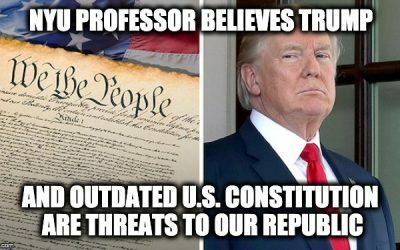 Perhaps its because the election is over and they can no longer lie about republican positions on the issues, the mainstream media is working hard via lies, spin and false reports, to sway opinion against Israel in its battle to stop the Hamas terrorists from firing rockets into her civilian areas. Between Saturday and Tuesday of last week Hamas terrorists fired over 150 rockets from Gaza into Israeli Civilian areas, this was on top of another 700 rockets launched this year prior to that assault. On Wednesday the IDF directed a precision attack on Ahmed Jabri, the head of Hamas’ “military wing” in the Gaza Strip. Jabri was a senior operative of the terrorist group and was directly responsible for executing terror attacks against the Jewish State in the past number of years. The mainstream media acted as if they were unfamiliar with Jabri’s history, the weekend of terror coming out of Gaza and in some cases the fact that Israel left the Gaza strip over seven years ago. there have been 2,907 AP news stories mentioning one of the two countries along with the word “drone” or “drones.” Of those stories, 208 also mention “assassination” or some derivative of that word. But only one of the 208 stories referred to an American drone operation as an attempted “assassination.” (A May 2003 article stated, “The U.S. government last year declared Hekmatyar a terrorist, and in May 2002 a CIA drone tried to assassinate him near Kabul, but missed and killed some of his followers.”) In the 9 years that followed, during which U.S. targeted killings increased dramatically, not a single AP article described American drone attacks as assassinations in the voice of the reporter. When discussing Israel, the media has its own language, like that term militant. The mainstream media is reluctant to use the term terrorist when discussing Hamas because they really believe one man’s terrorist is another man’s freedom fighter. As Jonah Goldberg described in his book “The Tyranny of Clichés” the only people that believe that a terrorist is indistinguishable from a freedom fighter are terrorist sympathizers and idiots. From the very beginning the media tried to imply the Israeli action was not justified. Wednesday morning saw Fox News’ Leland Vittert say the IDF was responding to “low grade” attacks from Gaza. In what world would 150 rockets fired at civilian communities be considered a “low grade” attack? Even days into the action (on Saturday Night), Long Island’s News 12 was claiming the entire escalation began with the Israeli killing of Ahmed Jabri, totally ignoring the missiles shot into Sderot and Ashkelon. On Friday’s ABC World News correspondent Alex Marquardt broadcast without question a claim by “one of the militant groups behind” the rocket attacks on Israel that they “wouldn’t fire rockets if Israel wasn’t killing us,” even though almost 700 rockets had already been fired out of Gaza into the Jewish state between January 1 and November 9, before Israel’s recent sustained military campaign began. Trying to show how “evil” the IDF is, photos of the dead 4-year-old Mahmoud Sadallah of Jabaliya, were distributed by the Associated Press, AgenceFrance-Presse and Reuters, all of the photos were sent out with captions stating the boy was killed in an Israeli air strike, despite the fact that news articles by the New York Times and even AP itself made clear that the circumstances behind his death were “hotly disputed,” (as AP put it), and that he may have been killed by an errant Palestinian rocket. ( as it turns out, the child was killed by an errant Hamas Rocket). 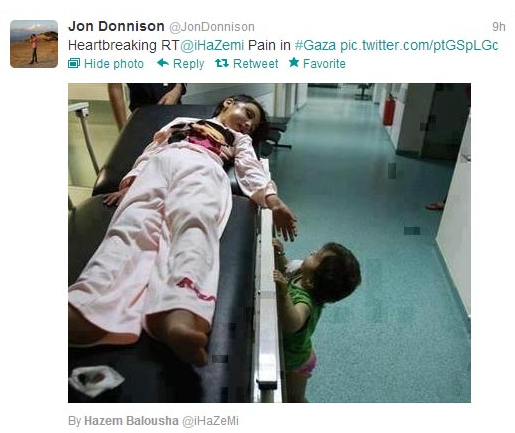 BBC reporter Jon Donnison, tweeted his 8,000 followers a picture of a dead girl with her little brother crying by her side, and described it as a heartbreaking picture from Gaza. While the picture was indeed heartbreaking it was from the Syrian civil war not from the Israeli action to protect herself from Hamas rockets. Then there is that”good ole moral equivalence lie”. A Financial Times editorial said Hamas bears primary responsibility for the escalation but the Netanyahu government “must also take much blame for stoking resentment among Palestinians in Gaza and the West Bank for so long.” Hey guys Israel pulled out of Gaza in August 2005, perhaps you were on vacation that year (it was in all the papers). The LA Times reported on November 15th; Death toll grows as Israel-Gaza violence escalates, a double whammy arguing a moral equivalence and using the term “Gaza” instead of Hamas or terrorists. Despite the “hint” from CNN, the original Hamas manifesto was never changed. These are not all the cases of biased reporting from the mainstream media nor do they comprise the full list of the most egregious cases. It is simply an alert to fair-minded people not to accept what they read, see, or hear from the mainstream media. They have an agenda to support the Palestinians and to delegitimize Israel at the expense the truth.